Living on the gulf coast, you always keep an eye out for the seagulls. Not because they are inherently dangerous (well...I'll get to that in a moment). But, seagulls are a good indicator of what's going on out in the Gulf of Mexico. If it's bad weather, say 10-15 miles out from shore, the gulls can be found flocking all over parking lots in the supermarkets, department stores, malls, etc. Usually, they are just looking for scraps of food. But, they are also looking for shelter. So, I usually pay close attention if I see them flying around more than they normally do. This past Sunday (Mother’s Day), I witnessed something I have never seen in the 50+ years I've lived on the gulf coast. I know this blog entry is going to cause a few snickers (or maybe a lot). But, I couldn’t pass up placing this entry in the blog. As I was coming out from a supermarket in my car, I saw a woman holding her child up in the air. She was hysterical. So, I turn back around and go over to see what was wrong, along with two other men who had rushed to her aid. There was blood coming from the child's forehead. The mother said a seagull had attacked her daughter right there in the parking lot. Astonished, I said; "are you..." and before I could finish, either another gull or the same one swooped down toward the four of us. I simply couldn't believe it! One man with a cane swung at the gull and the gull flew off. We all just stood there looking at each other in total amazement. Like me, most people on the gulf coast know this is completely abnormal behavior for a seagull. Of course, my first thought was the Alfred Hitchcock movie classic, "The Birds". But, this was one bird, just one seagull. In fact, I didn't see any other seagulls around but that particular one. The man with the cane said this was the second seagull incident he has witnessed since February of this year. Another man said his brother was attacked fishing off a pier, at nearby Dauphin Island, by two seagulls in March. In fact, he called the local newspaper to report the story. They told him he had been watching too many movies. I wouldn't have believed it either if I had not seen it with my own two eyes. I wasn’t sure what to make of this. I don't know if it's an anomaly or the indicator of nature gone wrong (spare me the global warming fanaticism). There was a seagull attack on people in Sidmouth, England in July 2006. 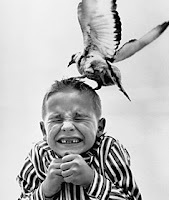 That was really all I could find when I googled seagull attack. It may be that a few attacks a year are normal for all I know. I just have never seen a gull attack people before. Living here on the gulf coast for so many years, you would think it would have made the news at least once if it ever happened. I don't think it's anything to get alarmed about. I just believe it is strange. Alfred Hitchcock would have loved my blog today..